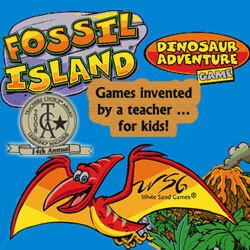 Take a trip through Fossil Island® for an exciting adventure of ups and downs. 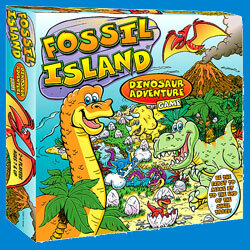 Players navigate a colorful dinosaur down an eggshell trail by rolling a die & solving an addition card problem. As you race across Fossil Island®, you get to discover shortcuts, take chances on Dino Dare© cards, survive the ups and downs, bump an opponent, and race ahead...try not to fall back! * It’s hours of fun for ages 7 and up. * Variations for many ages & abilities included. People of different ages and abilities will be able to play side by side without the fear of being wiped out. With all on an even playing ground and each making their best contributions, players are all together to the end of the game! It's completely unique to other board games - or even educational games, offering future potential for creating dozens of games from this one box. Change the game simply by adding a new deck of cards. Congratulations on being a Learning® Magazine 2008 Teachers� ChoiceSM Award winner! Click here to see some of the products White Sand Games has shared with ToyDirectory and TDmonthly Magazine.